The web server used by Cafebambu.net is located in Germany and run by BSB-Service GmbH. 12 other websites are located on this web server. Most of them are provided in the spanish language. 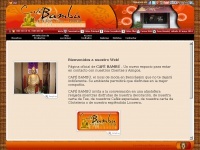 The websites of Cafebambu.net are served by a Apache server. Due to the robot information on the webpage, the following actions by webcrawlers are not allowed: following the links.